People frequently operate computer devices such as smartphones that collect user input and process this information to produce outputs on a display or through headphones. Engineers control how these tools function by designing circuits structured from electronic components that constrain the flow of electrical current. Similarly, the function of biological systems is fundamentally constrained by the structure of their circuit elements. Largely thanks to the magnification provided by light microscopy, we understand how the structure of most organs is related to their function. Take for example the networks of capillaries and tubules in the kidney, which provide the essential substrates for filtration, reabsorption, secretion, and excretion. A key exception is the brain, whose structure consists of such a dense and diverse meshwork of cell types, neuronal processes, and the synapses that connect them into circuits (somewhat analogous to those found in our electronics) that it cannot be resolved by traditional light microcopy. This is where serial-section electron microscopy (EM), which offers dense labeling and the necessary resolution, provides an attractive and timely alternative. However, the physical volume occupied by circuits of interconnected neurons—some of which can span nearly the entire brain—is many, many times larger than individual axons, dendrites, and synapses. This means that mapping even small brain regions is a problem comparable to producing detailed street-level maps of the entire world. The difficulties associated with acquiring, storing, and handling such vast quantities of data has made it challenging for neuroscience researchers to examine complete brains at high enough resolution to visualize all their important structures. As a consequence, the largest organism whose central nervous system has been imaged with EM in its entirety is the nematode Caenorhabditis elegans, which has only about 300 neurons total. 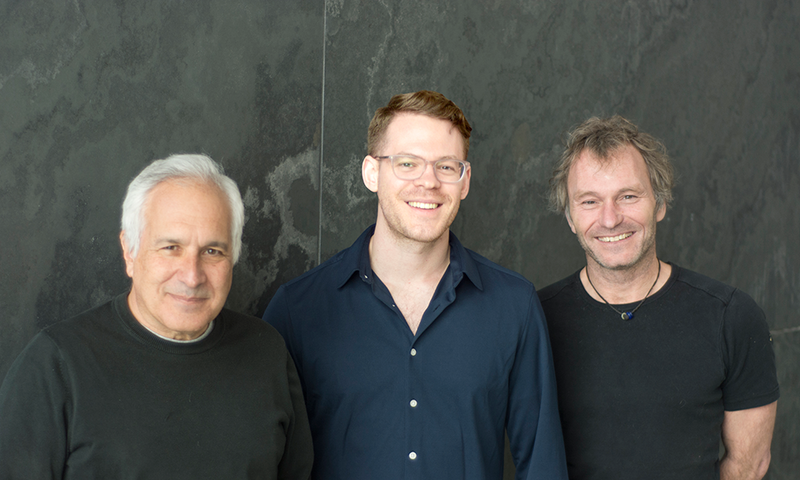 A recent study conducted in the laboratories of Florian Engert and Jeff Lichtman overcame many of the limitations associated with past efforts by utilizing multiple rounds of targeted imaging at different scales to study the whole brain of a larval zebrafish. This small vertebrate’s central nervous system contains approximately 100,000–200,000 neurons. By taking this approach, Program in Neuroscience graduate student David Hildebrand, who spearheaded these efforts, reduced the burdens of image acquisition time and data storage requirements to manageable levels. As a result, he made it possible to progressively capture the details of a whole brain at higher and higher resolution, zooming in on regions of interest while leaving others visible only from afar, as if producing an online map of Earth with every street in Europe visible but only a coarse overview available for the Antarctic. The group next decided to study the myelinated axons (the neuronal processes that rapidly convey electrical signals to other neurons) within their EM dataset of the larval zebrafish. This investigation illustrated the utility of this large-scale, multi-resolution EM imaging framework for examining structures that span entire brains. Morphological analysis of these axon projections revealed an unexpected degree of bilateral symmetry, where axons contained within the same small nerve bundle on the left and right side of the larval zebrafish maintained specific spatial relationships with their neighboring axons. It is possible that this is a previously unappreciated general feature of nerve tracts in the central nervous system, which could have important implications for their function and development. Additional imaging of larval zebrafish and other species’ nervous systems using similar approaches will likely provide key insights into the important relationships between structure and function in the brain. 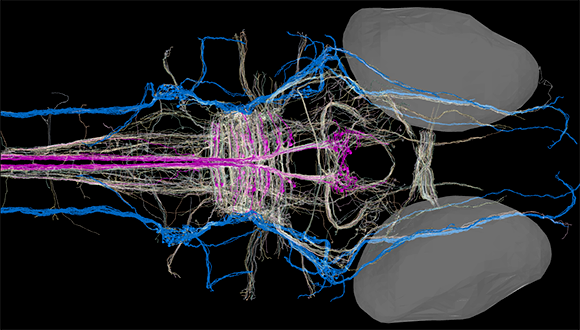 Image of an 5.5 dpf larval zebrafish depicts myelinated axon reconstructions with volume renderings of the eyes for reference. Two subsets are shown in pronounced colors. Lateral line (blue) and medial longitudinal fasciculus (purple) myelinated axons were observed to be bilaterally symmetric. The latter consists of identifiable neurons, which made it possible to compare the extent of their symmetry in detail in the paper.